Westmark BV, producer of CableSafe safety hooks introduces a new product Cable Stands to its cable and hose suspension solutions. Westmark introduced the ‘S’ shaped safety hooks in 1995, which are now the industry’s most widely-used solution for suspending hoses and cables to ensure a safe work floor. 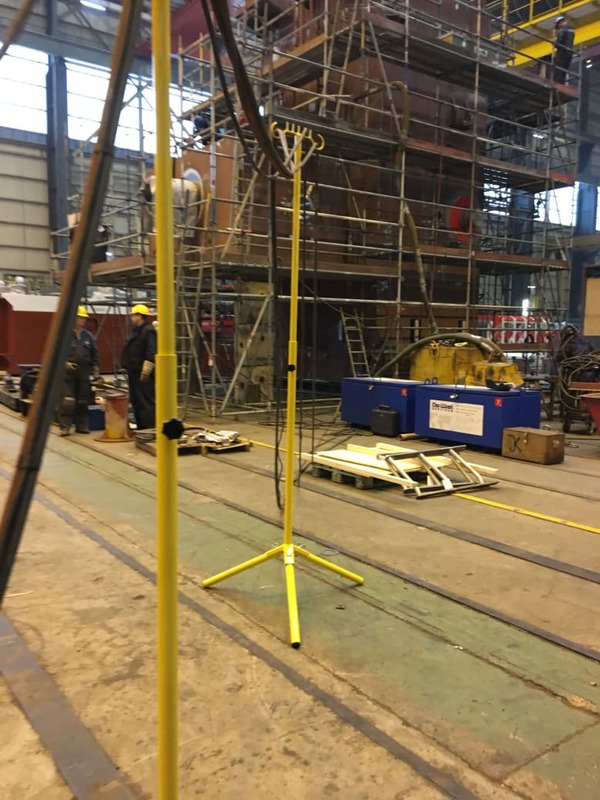 Prior to the introduction of the S-shaped safety hook, personnel used tie-wraps, steel wires, welding anodes and other self-designed solutions to remove obstructions such as cables and hoses from industrial work areas and walkways. This good housekeeping and safety item is instrumental for the prevention of slips, trips and falls. The S-shaped CableSafe hooks are always suspended on a hook-up point. The introduction of the Cable Stand creates a hook-up opportunity anywhere. 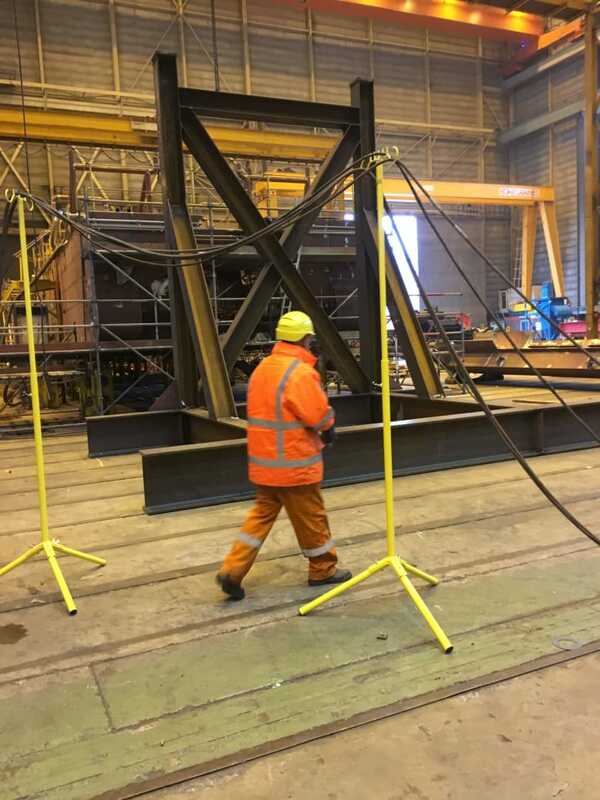 The stands can be extended in height and are ideally used in open areas, such a shipyards or new construction sites, or warehouse / storage areas. The stands are ideal in wet areas to help reroute hoses and electrical cables off the wet floors and out of puddles. Welders working in wet areas often have the electrical lines submerged in a puddle which presents danger when the lines are damaged. 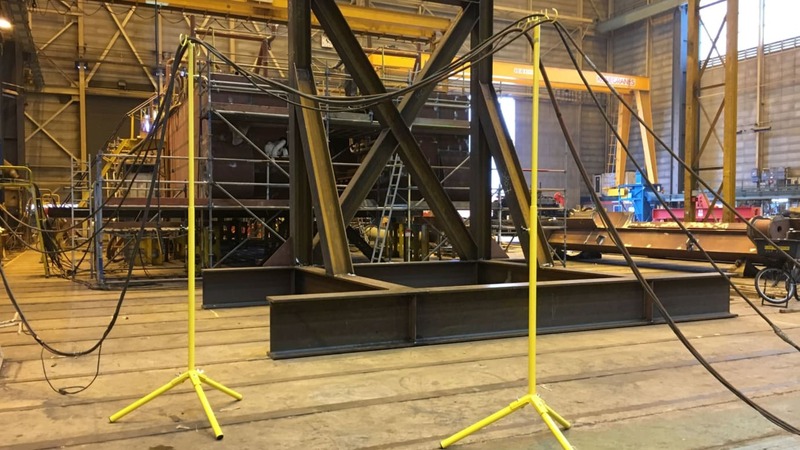 The stands are an ideal tool for a warehouse to continue work with a pallet truck or pallet wagon while maintenance jobs with cables and hoses are being performed. Keeping walkways and work areas free of dangerous obstructions is key to safety and good housekeeping. With slips, trips and falls accounting for the most number of accidents in the industry, CableSafe hooks and stands offer a simple solution. According to the Health and Safety Executive office in the UK, twenty-five percent of industrial accidents are caused by falls that are the result of slipping or tripping. Furthermore, the office reports that ninety-five percent of major slips and trips result in broken bones, a statistic that speaks for itself. How can you ‘tackle this rate’ and become aware of how to make significant safety improvements in your company? The use of safety hooks removes temporary tripping hazards caused by cables lying on the work floor and reduces the chance of damages and accidental spills as a result. CableSafe intends to ‘tackle’ the safety rate by contributing to a safer and cleaner workplace. The hooks and stands can be re-used for years, which make them a sustain¬able product. CableSafe was developed for the industry with safety as its highest priority. It has also proven its usefulness in the offshore and heavy industries, such as, refineries, chemical plants and shipbuilding. Employees and contractors must abide by their company’s safety procedures by hooking up temporary equipment used for all construction and maintenance work, using these safety hooks for suspension to adjacent decks, railings, stairs, scaffolding and other structures. CableSafe creates a tidy, structured & safe workplace.